“I’m think my old car had bad – pardon the pun – karma,” I said. A window-smash break-in in Sacramento on New Year’s Eve, so I had to drive hours with no back window and no stops (because all my luggage and stuff was in my car) because no glass shops were open for 3 days. 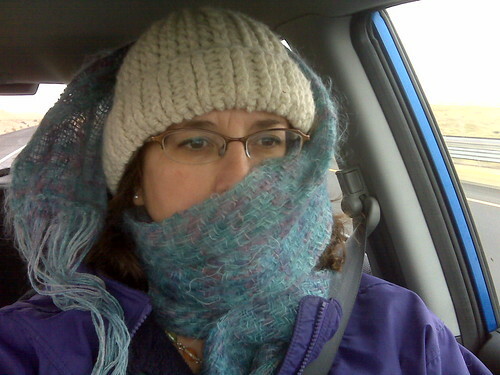 Driving home bundled up. The heater was blasting, but I was SO COLD. Ran over a scissors, the blade of which entered by tire and concealed itself inside. It was the weirdest thing. I first heard this clackety clack noise, then the noise stopped. Then a minute later my tire went flat. It wasn’t until I took my tire to get a new one that they found the blade inside the tire. They put it on their “greatest hits” list. I later figured out the “clackety clack” noise must have been the scissors handle, which broke off after a few seconds, leaving the stealth blade inside the tire. And finally, of course, becoming the cheese in a four-car sandwich (“Was the cheese car-gonzola?” my friend Mike said). Please tell me one of you doesn’t have a Blue Honda Fit voodoo doll with pins stuck into it. Cursed is right. However, “BOOM BOOM wap wap wap wap wobble wobble FLAT FLAT” is the best rendering of a flat in progress ever. i second magpie. nicely captured. Eek! Makes me glad that the blue was sold out and I had to settle for a silver Honda Fit! Is yours cursed, or was it just me? These would be more than enough events to make me not trust the car. And once you lose trust…. …someone rear-ends you at 40 mph. LOL. At first I read that as “mysterious ethical problem.” And we all know it’s not a good thing to drive a car with ethical problems. Right? hmm. well, any car i spend any time in ends up with bizarre electrical issues, and my jeep ate windshields as fast as i had them installed but i think yours was definitely cursed. You may have to travel by camel. ps I almost died the last time I rode a mule. I think a camel would truly put me over the edge.